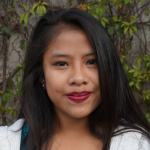 Emely is originally from Yepocapa, Chimaltenango and was selected as a GOJoven Fellow when she was 17 years old. She is currently studying and working. Her first training experience in sexual and reproductive health and rights was when she started with GOJoven. At the time, she assumed that she was an adult because of her life dynamics, but through this program she comprehensively learned about her health and rights as a young person. She aims to continue with her academic training to become a journalist who writes about all the violence that girls experience, because in her community the school does not give them information about sexual and reproductive health and rights.